I’m hopping on this train a little late, but I’m absolutely in love with Cloth Habit’s Watson bra pattern. I’ve made two in the past week. I started making my own bras last year because I love the natural shape that comes with soft cup bras, but the current taste for molded foam cups made it almost impossible to find what I was looking for. I’m not a fan of the round beach ball shape and shelling out $40 bucks a pop for Free People’s Cheeky Lace Bra got old really quick (I do still love this bra, but my wallet was not feeling it). When I started researching what actually goes into sewing intimates, Cloth Habit was the holy grail for lingerie construction knowledge. Amy’s lingerie-making journey has been incredibly inspiring to me, so it’s no surprise that her first bra pattern would be the subject of my first post. I’ve had a bit of red stretch mesh hanging around my sewing corner for a few months that was just begging to be used, so I decided to make my first Watson. I stocked up on some Jacquard acid dye and made like a mad scientist in the kitchen. 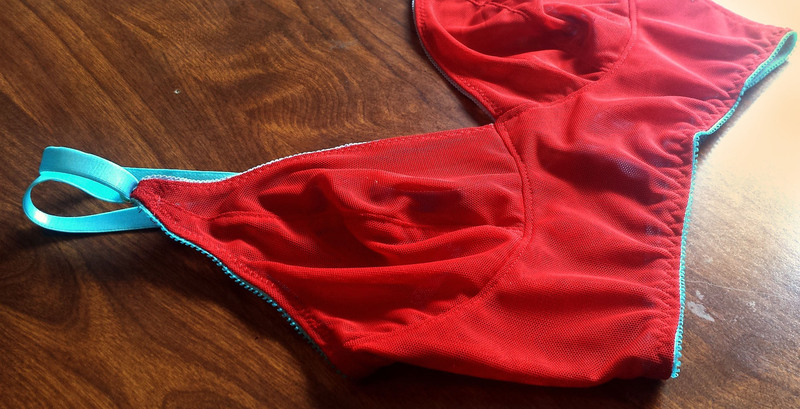 After dying a bunch of notions, I eventually decided to use some ice blue elastics to contrast the red mesh fabric. I’m loooving this look. All of the other bras that I’ve made have underwires, so I was pleasantly surprised to see how quickly this bra made up (only a few hours). It’s a great break from fiddling with underwire channeling. I do need some work on sewing in my elastics. The stitches aren’t quite close enough to the edge, but I’m getting better with every bra. Now, I’m not usually a casual bra person. I’m either wearing underwires or going free, but this bra changed my mind. The ladies are definitely lifted, but it still feels incredibly comfortable while keeping my natural shape.